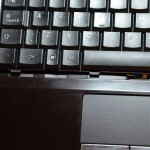 If you own any Notebook for longer than one year then there comes a time when the cooling fan starts to run constantly and the device starts to get hot even in everyday tasks. My U550 is now 1 and a half years old and has started to use the fan all the time so I decided it was time for some maintenance, so cleaning the fan. After searching the internet high and low I wasn’t able to find any guide on how to open the actual case of the U550. I actually got some results about how to repair a tractor but that’s a different story. So I decided to do it myself, and after 2 hours here are the results. This is a home made guide and should be treated as such, I will not be held accountable for any property damage that may occure in the usage of the following guide. I suggest finding a well lit place with plenty of space to spread out. Ok, now that we have all the preparation over let’s begin. Start by turning off the device, taking out the battery, DVD drive, cables and any other accessories you might have connected to it. 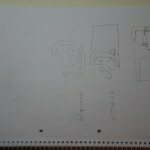 Turn the Notebook with the back facing upwards. Here we will have to undo 6 screws witch hold the cover for the RAM and HDD. 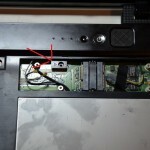 Remove the cover to gain access to the HDD and RAM. Remove the screw holding the HDD in place and gently remove the HDD from it’s slot by pulling to the left and after the HDD is free from the connector it can be removed. 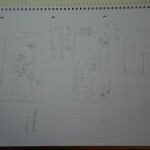 Also remove the RAM from their slots by pushing the metal retainers outwards and the modules should pop up and be easy to remove. Note: If you only want to make an upgrade to your system you could stop now and just install the bigger HDD, SSD or RAM in the place of the old ones and put everything back in place. This is where the notepad and pencil comes in handy. 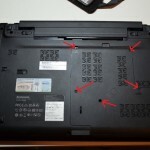 Remove the 15 screws holding the main back cover. 4 of these are longer than the rest so be careful where you put them. 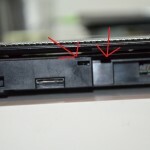 Lenovo has kindly marked the places where the long screws come so that you know were they were when you screw them back in. 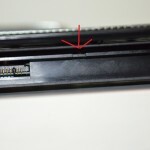 To remove the keyboard you need to use something really really thin to get between it’s edge and the plastic front bezel. I used the smallest bit I had for my screwdriver and began from the clip on the right side. After you’ve managed to lift the keyboard just a little you can use the credit card on the other clips all the way to the other side. 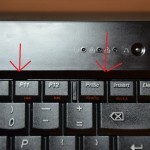 Then you can gently move the keyboard toward the screen to free it from the clips underneath the bevel. 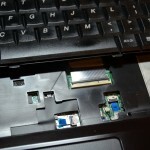 Now we have to remove the connector for the keyboard. It will be a wide flat cable witch is held in place by a black strip. 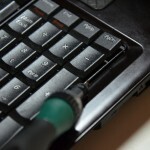 You have to gently lift/rotate the black strip to free the keyboard cable. 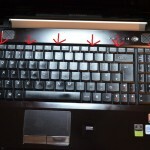 Place the keyboard in a place that won’t be in your way or where you can damage it accidentally. Note: the wireless card connectors are very sensitive so try to be gentle with them. 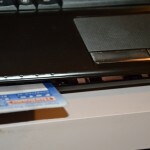 After all the connectors and screws have been removed you can start to insert a credit card or any other wide object in between the bevel and back cover and slowly lift the front bevel all the way around. It still is connected at the back with 3 very stubborn clips, I managed to brake 2 out of 3 so be careful. 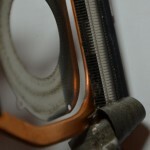 After you have opened the back clips the back and with all the screws and connectores removed the bevel should come off with ease. 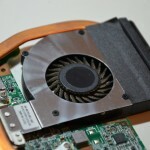 The CPU GPU and Fan are all connected to one board and can be removed easily. The entire assembly is held in place by one screw and has 5 connectors. 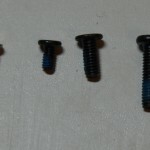 Open the screw and the 4 visible connectors and gently lift the piece to disconnect it from it’s 5th connection. 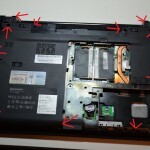 To remove the cooling system unscrew the 5 silver screws. 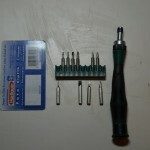 These are smaller than the rest so you need the other + screwdriver i specified in the beginning. Also don’t forget to disconnect the fan’s power connector from the other side. On closer inspection the fan was indeed full of dirt but not as much as I expected. The ducts were also dirty but like the fan nothing serious. 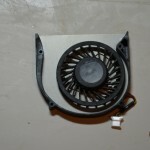 The actual cleaning of the fan is done with the help of a very specialized tool called a toothbrush. You can use any old toothbrush as long as it’s dry and it doesn’t have any residue toothpaste on it. To remove the residue toothpaste just brush it a few times with you finger and a lot of white powder will get out of it. 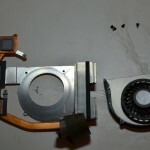 The reassembly is done in the revers order of the disassembly. If you have used your notepad and pencil this should not be a problem. Take it slow, check every screw and connector twice before moving on to the next step so that you don’t forget anything. For the reassembly of the cooling system on the CPU and GPU I recommend cleaning and applying new thermal paste so as to maintain the properties of the cooling system. 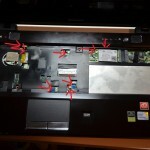 3 Responses to "How to clean the fan in a Lenovo U550"
I realy can’t tell you where it is. I wasn’t looking for it when i did this but i guess it should be somewhere on the smaller board (with cpu&gpu).